You hear it again and again- less is more. I liked to think I keep a lean and effective working closet, but changing lifestyles left me with a lot of clothes that- while still in great condition- aren't working in my life anymore. What to do with it all?In the past I've donated, but our local shops get inundated and I know they never even get to much of the donated items. 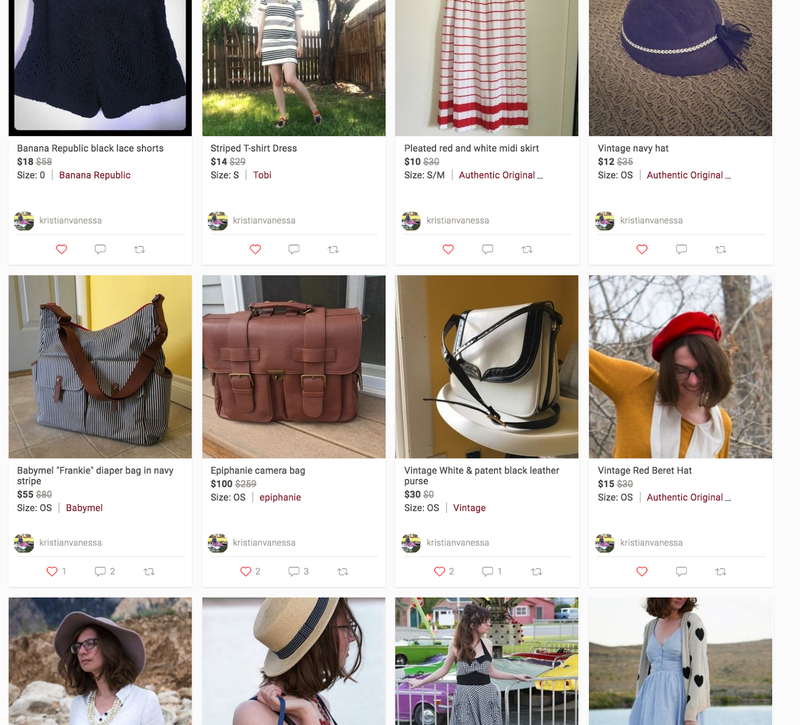 I decided to finally try out something other bloggers had been using with great success: Poshmark! Poshmark is a website that allows you to sell your clothes online. You can also search, as a shopper, for items you want at discounted rates. There are a lot of jewels on here! Here's how it works. As a seller, you sign up for free. Poshmark makes it money through a commission; It takes about a 20% of a sale, which some complain is a lot, but- it still makes me more than I would with any other option. Poshmark also takes care of postage. It makes labels for you, as the seller. You are in charge of mailing sold items yourself, which, if you are busy, can be more challenging. However, they give you seven days to send out items. Payment isn't released to the seller until the item has been delivered and accepted by the buyer. A buyer can only reject buying an item for very specific reasons, most of which boil down to the item was not as advertized (for example, the condition was worse than stated, stained or a knock-off item) or being damaged in transit. The seller can also be rated. Having a system in place streamlines the purchasing process and protects both seller and buyer! Come on over and shop my Poshmark Closet! Also- if you've got a closet with items you don't use anymore, why don't you join Poshmark? By using this code of: TNKEC you get five dollars of credit (and I also get some credit too, just to be totally transparent). If you already have a shop on Poshmark, share the link in comments below. I lovelovelove Poshmark & have made a sizable chunk of money off of it over the last few years. I don't really get the 20% commission complaints, either. Like, if it's between taking it to a donation bin or getting a little money for it, certainly the latter is more beneficial to me regardless of the commission costs?! Exactly- even with other paying options, it is WAY less work than a garage sale would be and most clothes go for max a dollar there. Maybe in areas where there are options like Buffalo Exchange type places, but here, there aren't other options and I like how much they protect both the seller and buyer. We have other options, but you have to take all your clothes in at once, hope they like/want some of it, wait for it to sell, etc. I like that, with Poshmark, I can list at my leisure, promote as often or as little as I want based on my own schedule, leave my listings in perpetuity until it sells! Ha.